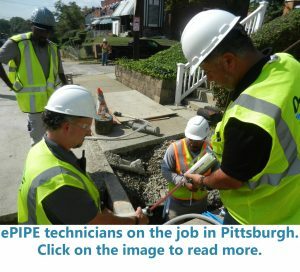 Under a pilot program agreement with PWSA aimed at reducing lead leaching from drinking water supply pipes, Pipe Restoration Technologies, using its patented ePIPE technology has completed th e in-place coating of “private side” service lines at six Pittsburgh area homes. In Pittsburgh, PWSA estimates as many as 17,750 residential service lines contain lead. These are the pipes which tie household plumbing into a water main beneath the street. They have two sections: the public portion that taps into the main, and the privately owned portion (private side) that runs from the curb stop into the building. Excavating and replacing a privately-owned lead service line (the water connection into a house) can cost some $4,500, according to the Pittsburgh Water and Sewer Authority. The price may vary by thousands from property to property. Using the ePIPE process has shown to provide substantial savings in the installation cost as well as substantial improvements in production when compared to current replacement techniques. Just a month ago Pipe Restoration officials met with PWSA and worked together to develop and complete this pilot program. The program involved ePIPE technicians from California and D.C.
A total of 6 properties were completed; two the first day of the pilot program and four on the second day. Each of the six properties were completed within a four-hour window. The lead service line was exposed at the curb stop on the city property which allowed for the ePIPE process to be completed with no excavation on the customer’s property.